CLAUDE TEXAS - USA 1999: FIVE TEENAGERS WERE KILLED WHEN THEIR CAR CRASHED INTO AN ON COMING LORRY. 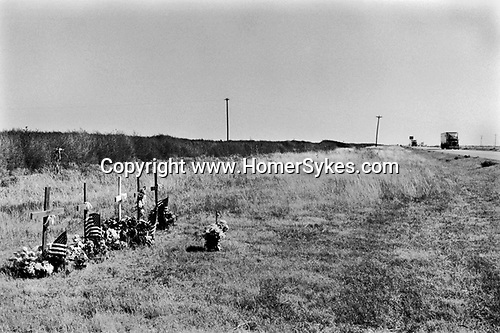 THEY ARE BURIED AT THE SIDE OF THE ROAD AND THEIR GRAVES ARE MARKED BY SMALL WOODEN CROSSES. THEIR LOVED ONES HAVE PLANTED SOME FLOWERS AND THE STARS AND STRIPES FLAG IS ATTACHED TO EACH CROSS.